A poker art-form lost in the abyss of shortened attention-spans and Jackpot SNGs. 9-man SNGs served as an entryway into poker for many of us old-schoolers, and Winning Poker Network has recently made it their mission to resurrect the classic and once beloved format. WPN’s aptly named Sit & Go 2.0 is striving to bring life back to the online 9-max format by adding a Jackpot element to the prizepool and payout structure. SNG 2.0 recently launched its live-poker counterpart at the Punta Cana Poker Classic. So did the “test run” of SNG 2.0s live up to the hype? Well I know one thing, it can’t possibly be worse than Aria’s now removed Multi-Action Poker table. The Punta Cana Poker Classic – the flagship live tournament from the WPN network now in its 7th year – was recently hosted at the Melia Caribe Tropical at the eastern-most tip of the Dominican Republic. With an eclectic mix of players ranging from recreational players, over 150 satellite qualifiers, professional online grinders and seasoned live and online veterans such as Humberto Brenes, Faraz Jaka and crowd favorite Doug Polk, the PCPC was a true microcosm of the poker world. Although poker was obviously the primary focus, as is the case with most destination tournaments the week-long event was as much about one’s experiences outside the poker-room as those within it. 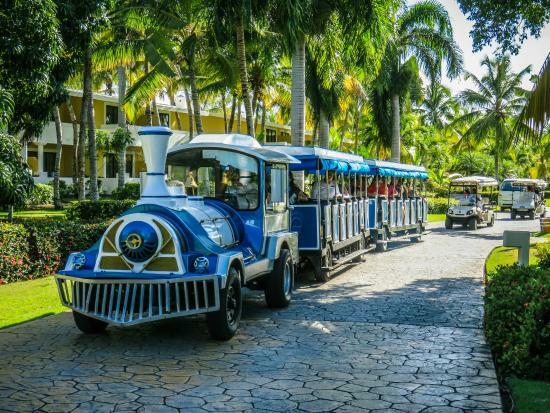 The Melia Resort in beautiful Punta Cana offered players an all-inclusive experience that included 13 restaurants, 14 bars and door-to-door transportation around the large property via personal golf-cart-like vehicles and three colourful transport trains that were a constant amusement to us all. Those interested in chasing some added adventures could participate in ATV trips, snorkelling and diving trips and even parasailing. Although I failed to convince Doug to join me for a romantic tandem-parasailing adventure, the team from America’s Card Room got him to take a break from the beach long enough to get his thoughts on the event, location and live tournaments in general. Not only did the Punta Cana Poker Classic include a 500K Guaranteed Main Event, it also served as the coming-out-party for the world’s first live Jackpot-style SNG, the brainchild of WPN CEO and all around great guy Phil Nagy (check out my interview with Phil here). After the dealer draws high-cards for the button, each player at the table is dealt 1 card face-down. Beginning with the small-blind position, each player takes a turn flipping their card over with the hopes of revealing a black card. If the first card is indeed a black one, the big-blind flips theirs over and the process continues in this manner around the table until a red card is revealed. The prize-pool and payouts are then set according to the image below (based on a $10 Buy-in). Going into it, I wasn’t quite sure what to expect from the SNG 2.0 experience. As a Spin & Go player and coach, I was hopeful that bringing the jackpot element onto the poker-room floor would create the same level of enthusiasm for recreational live-players as it has done for their online counterparts. Based on my own experiences over the past week, I am happy to report that SNG 2.0 managed to do exactly that! Players flocked to these games in a way I hadn’t seen in the live-poker scene since…well…ever. The format really did create a sort of comradely among its participants that doesn’t exist in any other variation of the game that I’ve ever seen. Check out the video below of the first SNG 2.0 ever played, which, as it turned out, I was fortunate enough to ship on my way to becoming the world’s first SNG 2.0 champion – an honour I will carry with me until the end of time. The Punta Cana Main Event drew 476 entries, at least a third of which were online qualifiers who earned their spot for as little as $1 through the WPN network. With a $143,675 first-place prize up for grabs. the Punta Cana Poker Classic Main Event was one of the highest-value tournaments on this year’s live-poker tournament schedule. That said, neither Doug Polk nor yours truly was able to cash, let alone final table, an honour reserved for the 8 players shown below, all of whom walked away with a minimum of $18,000. Equally as tragically, just as Upswing Poker hero Doug Polk was getting set to host the FT a power-surge fried the broadcasting equipment and prevented the tournament from being streamed at all. Apparently the equipment is fried and there will not be a stream of the final table today. Fortunately, Doug and I did manage to get a short inception-style video where we simultaneously broadcast each other to the world. Hey, when you’re running bad you gotta take your victories where you can get them!